The Colours are those of the 2000 Derby Winner. The ties are green with a red stripe. Cornet Steven Hotson at the gallop! In 1759 Court of Session in Edinburgh awarded the Burgesses of Langholm certain legal rights and privileges. Most importantly the recognition of the community having ownership of part of the Ten Merk Lands, particularly the Common Moss and the Kilngreen. Through the award it was now the Burgesses' responsibility to mark and define all boundaries of the communal possessions by erecting cairns, beacons and digging out ditches and pits. The first elected man to perform these tasks was the Town Drummer Archibald (Bauldie) Beattie. He walked the the 'Marches' for over fifty years performing his duty and died in 1823, aged 90 years. In 1816 the first horseman to ride the common was the landlord of the Commercial Inn, Archie Thomson along with other townsmen, John Irving of Langholm Mill, Frank Beattie, landlord of the Crown Inn. These men were known as the 'Fathers of the Common Riding'. These men were responsible for starting horse racing on the Kilngreen, the same year as they rode the Marches together. In 1817, the first 'Cornet' or Master of Ceremonies was duly elected by the residents of the old part of the town. It was some years later, in 1843 before residents of the New Town were allowed to vote. In the same year a departure from the old practices was made when a man from the New Town, a 'Meikleholmer' was elected to hold the office of Cornet, a blacksmith named Robert Anderson. It was in 1919 that a decision was made to hold the Common Riding on the last Friday in July. The colours of the ties, ribbons, and rosettes are uniquely chosen by taking them from the racing colours of the winner of the Derby. 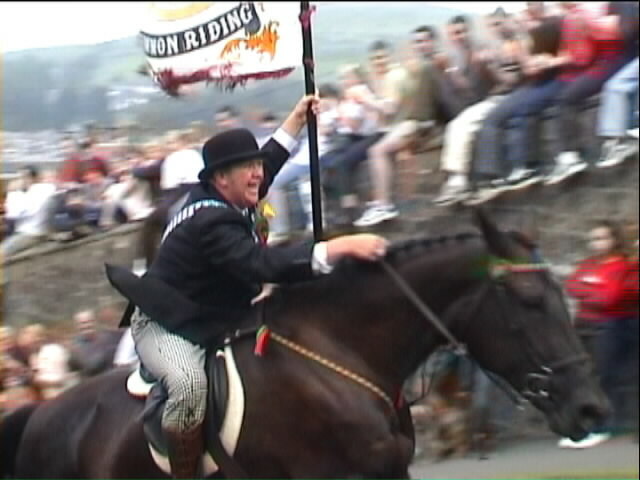 One of the features of the Langholm Common Riding is the quaint and unique set of emblems that are carried aloft throughout the street processions. A SALTED HERRING pinned to a BANNOCK which is fastened to a wooden platter by a 'twal-penny nail' and flourished aloft on a pole. The bannock symbolises privileges of the Baron under the obligation of Thirlage, and the herring may be symbolic of the right of the Baron to the fisheries of the Esk. The SPADE is the very epitome of the Common Riding, through its use for cutting sods at different points of the 'Common' and for clearing out the pits which were originally boundary markers on the Common Moss on Whita Hill. A gigantic locally grown Scotch THISTLE is the third emblem, the origin of which is obscure. As it is the national emblem of Scotland it was probably adopted as such, or on account of its 'jags' as a warning to those who were contemplating molesting the Fair. The fourth emblem is the FLORAL CROWN - it has no historical significance, and may have been adopted as a symbol of loyalty to the sovereign. The most interesting feature of the Common Riding is undoubtedly the 'Crying of the Fair'. This falls into three parts, the first part calls upon the townspeople to go out in defence of their rights; the Fair itself is the ancient proclamation, and the conclusion expresses the satisfaction which comes from a duty faithfully performed. I'll cry the Langholm Fair and then we'll beat the drum. Now, Gentlemen what you have heard this day concerning going roond oor Marches, it is expected that everyone who has occasion for Peats, Breckons, Flacks, Stanes or Clay, will go out in defence of their property, and they shall hear the Proclamation of the Langholm Fair upon the Castle Craigs. And gin ye're a' pleased I'll cry the Langholm Fair. Hoys yes! that's the third and the last time. that there is a muckle Fair to be hadden in the muckle Toun o' the Langholm on the 15th day of July, auld style, upon his Grace the Duke of Buccleuch's Merk Lands, for the space of eight days and upwards; and a' land-loupers, and dub-scoupers, and gae-by-the-gate swingers, that come to breed hurdums or durdums, huliments or buliments, hagglements or bragglements, or to molest this public Fair,they shall be ta'en by order of the Bailey and Toun Cooncil, and their lugs be nailed to the tron wi' a twalpenny nail, and they shall sit doun on their bare knees and pray seven times for the King and thrice for the Muckle Laird o' Ralton, and pay a groat tae me, Jamie Ferguson, Baillie o' the aforesaid Manor, and I'll away hame and hae a Bannock and a saut herring tae ma denner by way o' auld style. Electric Soup © I.W.Logan MCIT 1998-2000. Last updated: 01 Aug 2000 at 1455BST.